It was lunch time when I finished my tour of the Shaanxi Museum of History. Not far down the road, accross from the museum, I found a noodle house, and had a bowl of beef noodles. After lunch I took a taxi to the Big Wild Goose Pagoda. 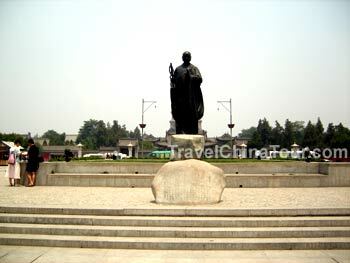 Monk statue infront of the Big Wild Goose Pagoda. The entry fee to the Big Wild Goose Pagoda is $20 yuan (~$3USD). Big wild goose pagoda far off in the distance. 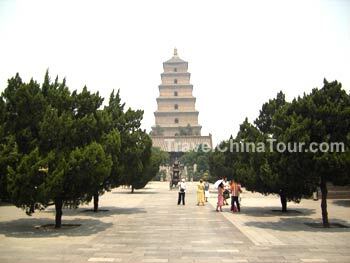 Right after entering the park from main entrance, there’s a bell tower (right side) and a drum tower (left side) situated on the two sides of the main path heading to the Big Wild Goose Pagoda. The photo above is taken from the main entrance, facing the pagoda. You can't see them, but the bell tower and the drum tower, are on the two sides of that main path. Now, don't confuse these two bell and drum tower with the actual world famous landmarks that are located in Xian city center, within the Xian city walls. These are 'miniature' bell and drum towers, nothing like the real ones. You can't enter these miniature towers at the Big Wild Goose pagoda. You can read my blog on the Bell Tower here, and the Drum Tower here. On the way to the Pagoda, after climbing a series of steps, there is a temple for worshipping. Infront of this temple, there is a large incense and candle burning pot, where you can burn candles and incense to pray for good fortunes. To get to the pagoda, you go around behind this temple, where you'll see a series of small buildings that has various religious items on display, such as carved jade Buddhas. 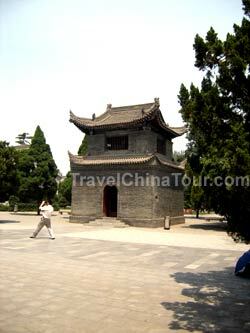 After you finish touring these small buildings, you come up to the entrance of the Big Wild Goose Pagoda. 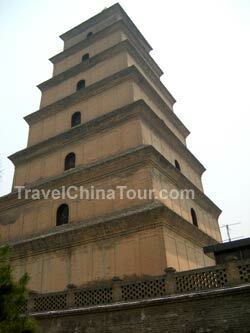 The fee to climb the pagoda is $20 yuan, and is not included with the entrance fee. Although the Big Wild Goose Pagoda is about 20 meters taller than the Small Wild Goose Pagoda (64.5meters tall), inside is only seven stories tall, each of its levels are much taller compared to the Small Wild Goose Pagoda. The top levels is closed off unlike the Small Wild Goose Pagoda, but you still get a nice view of the surrounding scenery. View from the top level of the Big Wild Goose Pagoda. Facing the south gate main entrance. 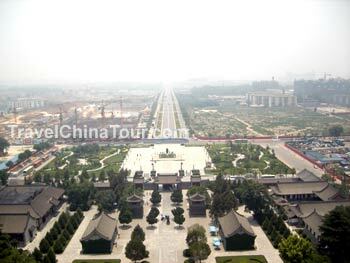 The Bell and Drum towers can be seen in the photo on the left and right side of the main entrance path, and the park with the monk statue is the large park you see in the back. The Dacien temple was built in 648AD to honor the empress Wende. The temple has 13 courtyards, and has 1897 rooms that occupies an area of over 24 hectares. 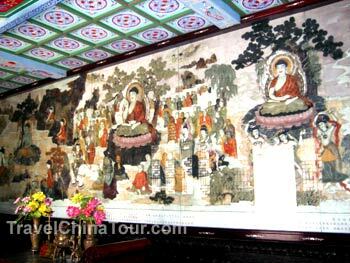 At one point, over 300 monks and priets lived in the temple, and it was the most famous temple in Chang'an city during the Tang Dynasty. In 652AD a Buddhist pilgrim named Xuan Zang arranged for the building of the Big Wild Goose (Da Yan) Pagoda to preserve hundreds of volumes of Buddhist scriptures which he brough from India. The original pagoda was built with an India style that was 5 levels tall. In 701 to 704, the pagoda was rebuilt to seven stories tall. Today, the Big Wild Goose Pagoda is 64.5m tall with seven stories.